It was during the spring of 1950 that Winnipeg experienced a flood that would eventually lead to the construction of the Red River Floodway. Over the course of the flood, 100,000 residents were evacuated from their homes. As the Red River rose, much of Winnipeg was inundated. After reviewing the impact of the flood, Manitoba Premier Duff Roblin sparked the idea of constructing a diversion channel around Winnipeg that could be used during extreme flood emergencies. Despite criticism, Roblin pushed ahead with the project. Construction of the original floodway started on 6 October 1962 and finished in March 1968, at a cost of $63 million. It was a major undertaking, resulting in the excavation of approximately 76.5 million cubic metres of earth. 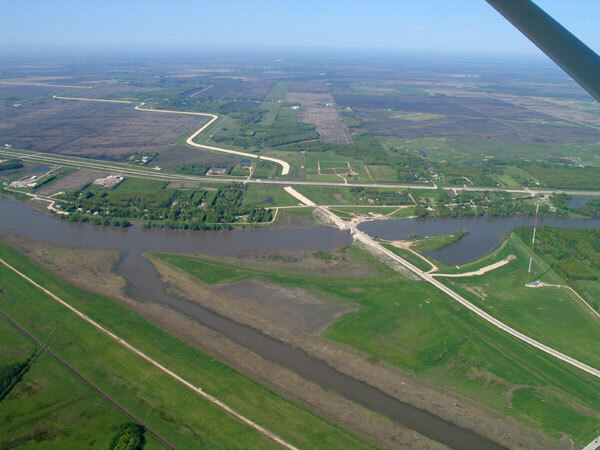 The floodway consists of a 47-km channel that, during flood periods, diverts part of the Red River’s flow around Winnipeg to the east and discharges back into the Red River near Lockport. To commemorate completion of the vast undertaking, a pair of plaques were set upon a conrete display and installed at a site south of the Inlet Control Structure, near the Floodway entrance. 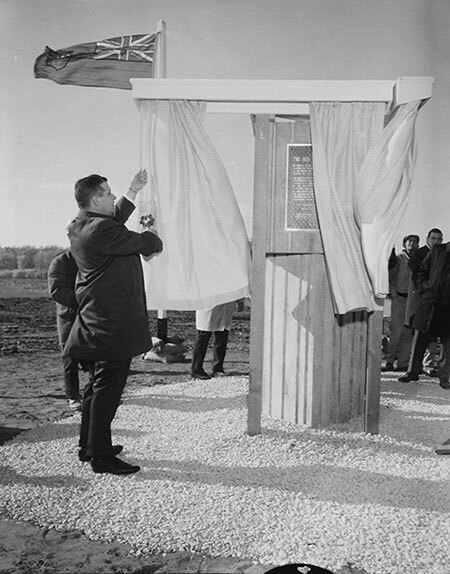 They were officially unveiled by J. J. Greene (Federal Minister of Energy, Mines, and Resources Canada) and Premier Walter Weir on 11 October 1968. Both plaques have since been dismounted and relocated to an interior wall of the Inlet Control Structure. 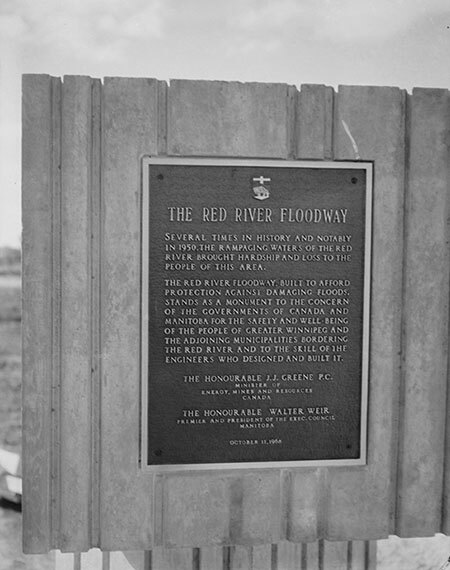 Since its construction, and subsequent first use in 1969, the floodway has been operated numerous times and saved billions of dollars in flood damage. 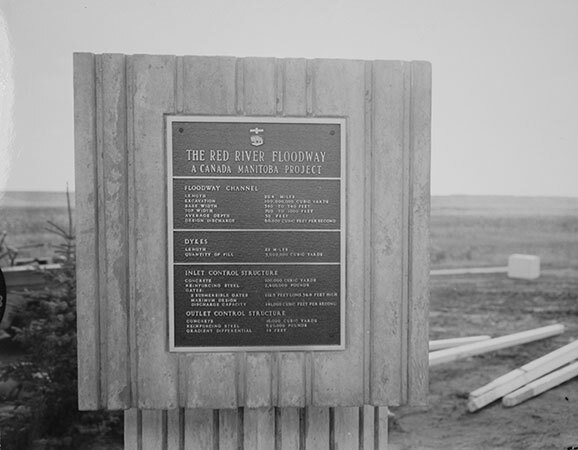 The Red River Floodway is considered to be one of the most important infrastructure projects in Manitoba’s history and is affectionately called “Duff’s Ditch.” In 2001, it was designated a National Historic Site by the Historic Sites and Monuments Board of Canada, although installation of an associated plaque is, as of 2011, still pending. Duff's Ditch, Red River Floodway Expansion Project. We thank Tim Worth and Nathan Kramer for providing information used here, and Scott Jackson (Manitoba Infrastructure) for providing the present location of the original two plaques.